My hairline is receded and I would like to know if it is possible to have the hairline I did in high school if I have a procedure? Unfortunately, a hair transplant will never match a patients hair loss hair for hair however, depending on the severity of the patients androgenic alopecia (genetic hair loss) a hair transplant can provide the patient with good coverage and the “illusion” of density through out the scalp. Most individuals are born with approximately 100 follicular units (fu) per square centimeter (cm2) prior to experiencing any hair loss, I can transplant anywhere from 40-60 follicular units per cm2 and even more when appropriate for the patient. Hair loss does not become visible to the human eye until more than 50% of density has been lost. Therefore, an individual who once had 100 fu per cm2 could restore visual density with approximately 50 fu per cm2, this is why hair restoration is successful. I create hairlines according to the patients desires, as long as what the patient wants is within the normal range. The goal to reconstructing the hairline is to provide the patient with the hairline they would have had if they did not suffer from hair loss. In conclusion, there are several variables that must be considered before performing an aggressive hair transplant on a patient. 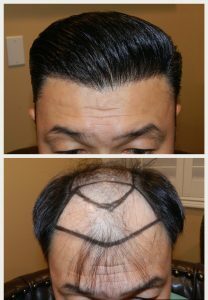 For example, surgeons must take in to account the patients age, donor density, hair loss pattern and future hair loss. All of these factors, will determine the longevity of the patients results and ultimately the patients satisfaction with their procedure. 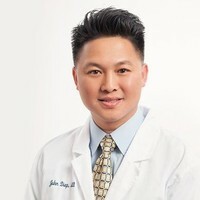 In addition, it is important that patients understand the progressive nature of androgenic alopecia (genetic hair loss), because hair loss spreads and get’s worse over time. Moreover, the donor supply is a finite resource that must be used in a way that provides adequate density and coverage over a patients lifetime. With that said, some patients with advanced hair loss patterns are still able to restore their youthful hairlines, but this varies from patient to patient and depends on the aforementioned factors, as well as the surgeon selection.